The Slava class was designed as a surface strike ship with some anti-air and ASW capability. Falling midway between the massive 'Kirov' battle-cruiser and 'Sovremenny' class destroyers, this smaller contemporary of the Kirov may have been intended as a less-expensive complement to the larger ships. Slavas were built at the same yard that built the 'Kara' Class cruisers, and the hull appears to be a stretched version of the earlier design. The sixteen SS-N-12 Sandbox anti-ship missiles are mounted in four pairs on either side of the superstructure, giving the ship a distinctive appearance. Many sources credit the Slava with the ability to carry nuclear armed SA-N-6 surface-to-air missiles, and 21-inch nuclear torpedoes, in addition to the SS-N-12. Soviet sources denied that the SA-N-6 missiles on the ship was even nuclear capable. They also indicated that the crane aboard the ship was used for handling boats, and not for loading or reloading SA-N-6 missiles, a procedure accomplished only at portside. Initially designated Black Com1 by Western intelligence and subsequently the Krasina class , the first Slava class cruiser became operational in 1983, and by 1990 three were in the fleet, with the third beginning sea trials in August 1989. Some sources suggest that the Soviet Navy intended to build as many as 21 units of this class, which would have enabled the Soviets to replace the Kynda and Kresta classes as they retired in the 1990s. But such plans were not evident in actual Cold War era building activity. The low priority attached to this class was evident from the unusually long construction period of the units completed by the end of the Cold War, and the fact that only four units were laid down. The design is said to be marred by large quantities of flammable material and poor damage-control capabilities. As of 2004 there were only 3 ships of this type available in the Russian Navy. The Moskva (ex-Slava), which had been in refit at the Nikolayev yard since December 1990, remained undelivered to the Russian Black Sea Fleet through the end of the millenium. The Moskva (ex-Slava), which had been in refit at the Nikolayev yard since 1990-91, remained undelivered to the Russian Black Sea Fleet through the end of 1998. The Moskva was expected to return to service to replace the Admiral Golokov as the flagship of the Black Sea fleet. No projected date for completion of this much-delayed work was known. The Moskva was finally returned to service in April 2000, replacing the Admiral Golokov as the flagship of the Black Sea fleet. The "Moskva" was finally re-commissioned with hull number "121" after its overhaul in 2000. In mid-2008 the official newspaper of the Russian Black Sea Fleet (BSF) reported that the large anti-submarine ship (BPK) “Ochakov”, which has just finished repairs, could become the flagship of the BSF instead of the cruiser “Moskva”. “This project 1134B BPK (Kara class), designed more than 40 years ago, had entered the 21st Century with a millennial overhaul with the aim of extending its service life 15-20 years. This is an unprecedented event for the fleet…” Intermediate repairs began at the end of the 1980s, however, with the breakup of the Soviet Union, they were never finished. Additionally a serious fire in 1993 significantly complicated the technical condition of the “Ochakov”. The second unit, the Marshal Ustinov, was commissioned with the Northern Fleet in 1986 - initially with hull number "070", later number "088" and finally number "055". The Marshal Ustinov may also be laid up in refit, though sources are in disagreement on this point. Ustinov was in overhaul in the Baltic since 1994; she was previously assigned to the Northern Fleet but may not return there. Under a December 1996 agreement China purchased two Russian Sovremenny-class destroyers. With the Russian Navy's consent, Severnaya Verf used some of the money to repair the Large ASW ship Admiral Levchenko ($98 million), Large ASW ship Severomorsk ($33 million), and cruiser Marshal Ustinov ($54 million) for the Northern Fleet. As of 2004 the latter had completed its repairs and became operational once again. 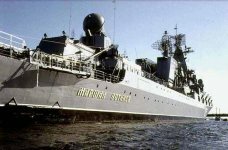 The third unit was commissioned to the Pacific Fleet in 1989 under the name "Chervona Ukraina" - in 199x it was renamed 011 Varyag, when this name formerly given to the Pr 1143.6 heavy aviation cruiser(sister ship to the "Kuznetsov") was released after the cancellation of further aviation cruiser development. As of 2002 it was reported that the Varyag was in "Reduced Manning" status, and entered the Dalzavod Shipyard the same year for repairs. Varyag had been in reduced operating status with a caretaker crew since her arrival in the Pacific in 1990. The fourth unit was initially expected to be launched in 1990, though in practice this vessel remained incomplete as of late 1999, having transferred to the Ukrainian Navy. On 21 February 1998 the government of Ukraine announced plans to complete the fourth Slava-class cruiser [ordered for Russia as the Admiral Flota Lobov] as its new fleet flagship, the Ukrayina. The ship was to have been completed for the Ukraine Navy in November 2000, but lack of funds slowed work to the point that by early 2001 a new completion date was projected. Oktyabrskskaya Revolutsia was originally named Rossiya, but renamed on 30th December 1987. Work was apparantly never started and the ship was cancelled on 4th October 1990. Some sources suggested that as many as two additional units began construction before the end of the Cold War, but the status of these hulls is unclear, and there is no indication of plans to complete them [should they in fact remain in existence]. Work on Admiral Gorshkov was apparantly never started and the ship was cancelled on 4th October 1990. MOSCOW, September 11 (RIA Novosti) - The Russian Navy has denied media speculation that the Moskva missile cruiser, the flagship of the Black Sea Fleet, needed repairs at a shipyard after a recent incident on board. The Navy earlier acknowledged that smoke filled one of the auxiliary compartments of the warship on September 7, but said its source was quickly found and contained. No one was hurt in the incident. "Several media sources speculated, citing different sources, that the Moskva missile cruiser of the Black Sea Fleet will be sent from Sevastopol to a shipyard in Nikolayev [Ukraine] for repairs after the alleged damage. This information is untrue. The Moskva cruiser remains ready for combat," the Navy's press service said late on Thursday. "The crew of the warship will fix the faulty systems at its current location at a berth [in the Sevastopol naval base] within a few days," the press service said in a statement. The Moskva is a Slava-class missile cruiser designed as a surface strike ship with some anti-aircraft and ASW capability. The ship has 16 SS-N-12 Sandbox nuclear-capable supersonic anti-ship missiles, mounted in four pairs on each side. Ukraine's ex-PM proposes finishing missile cruiser with Russia! 17:59 19/09/2009 KIEV, September 19 (RIA Novosti) - Ukraine's former premier, Viktor Yanukovych, who now heads an opposition party, proposed on Saturday finishing the construction of a missile cruiser stalled for almost 15 years now jointly with Russia. Construction of the Slava-class Admiral Lobov cruiser (Project 1164) was launched in 1984 at the Nikolayev shipyard in Ukraine but stalled at the final stage, when it was more than 90 % ready, in late 1980s due to a sharp reduction in military expenditures. The cruiser was renamed the Ukraina in 1992. 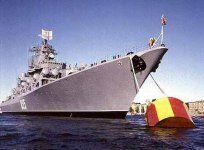 "There is a possibility to finish the [Ukraina missile] cruiser jointly with Russia... Provided there is a relevant political decision between Ukraine and Russia this issue will be solved," Yanukovych said when visiting the shipyard. Yanukovych and the ex-Soviet state's incumbent prime minister, Yulia Tymoshenko, lead the opinion polls ahead of presidential elections scheduled for January 17. Oleksandr Kuzmuk, a former Ukrainian defense minister and member of the Yanukovych-led Party of Regions, said most of the vessel's systems currently need modernization. According to data from last October, about $30 million is needed to complete its construction. Slava-class cruisers were designed as surface strike ships with some anti-aircraft and ASW capability. They carry 16 SS-N-12 Sandbox nuclear-capable supersonic anti-ship missiles, with launches mounted in four pairs on either side of the superstructure. In addition, the cruiser is reportedly armed with 64 SA-N-6 Grumble long-range surface-to-air missiles (SAM) and 40 SA-N-4 Gecko short-range SAMs. Russia has three Slava-class cruisers in service with its Navy. Uh, the thing has been rusting there for the last 25 years. Scrap the piece of junk. A task force from the Russian Pacific Fleet led by the missile cruiser Varyag has returned to Russia's Far Eastern port of Vladivostok after a visit to Singapore. The group, which set out from the Russian Far East port on October 27 on a month-long tour-of-duty, also includes the Fotiy Krylov salvage tug and the Pechenga tanker. It arrived in Singapore on November 11 and left a week later. A Pacific fleet spokesman said no incidents were reported during the journey. "All the seamen are in good health, the equipment and mechanisms operated smoothly," the source said. Varyag is a Slava-class missile cruiser, which entered service with the Pacific Fleet in 1990. In April this year the warship led a group of 21 foreign naval vessels participating in a parade to mark the 60th anniversary of China's Navy off the coast of the Chinese city of Qingdao. Good news. Cannot wait for the procurement of the other cruisers as well. Any news on the Slava Class Cruiser there ? Stealthflanker wrote: Any news on the Slava Class Cruiser there ? There hasn't been any decision on upgrading any of the old cruisers yet. Upgrading old vessels is a risky business in some cases. In the case of the old Kiev class carrier upgrade for India the problem was they expected to be able to leave a lot of the wiring and pipes in place. When they opened her up for the upgrade it was found it needed to be completely rewired and repiped which added time and material costs. With an upgrade of a Slava class vessel or for that matter a Kirov class vessel it is more straight forward in the sense that it is known from the start all the wiring and possibly even propulsion needs replacing. The simple fact is that if you want carriers then you need large ships to operate with the carriers to help protect the battle group. The huge advantage is that modern versions of weapons and sensors are smaller and lighter than Soviet era weapons so you can either carry more or free up space for extra supplies to increase deployment range/time. The Kirov class were the first operationally deployed vessels with vertical launch system for missiles, but further improvements could greatly improve defence performance. For instance the SA-N-6 SAM system had a range of 90km in the 1980s, with 96 missiles on board with 12 ready to launch missiles with 8 further missiles in magazines for reloading. Today using the newer missiles you have a choice of the same number of missiles (96) with a range of 400km, each in their own launch cells ready to launch, or a mix of smaller missiles with a range of 40km and 120km with 4 times more missiles (384 missiles) all ready to launch, or a combination of the two... say 40 missiles with a range of 400km, plus the remaining 56 launch cells each with 4 missiles, say half (112) 40km range and the other half (112) 120km range. That is 264 missiles and that is just the SA-N-6 system. New compact sensors and weapons alone will make the tops of the vessels less cluttered and reshaping of the superstructure could be used to reduce radar signature considerably. Smaller vessels can be produced from scratch using the latest sensors and weapons too, so there is no reason to have idle shipyards. Russian leadership has at last made up in one of the most protracted negotiation of weapons processes. , Told "Academy" a senior Ministry of Defense has already decided that Moscow would not buy from Kiev unfinished missile cruiser "Ukraine" at any price. The only option - his donation of Russia. Missile cruiser "Ukraine" (the former Admiral Lobov, "Project 1164" Atlas ") was founded in 1984. In 1996, its completion has been discontinued due to lack of funding, then the Ukrainians tried to resume it, but in 2001, finally abandoned. Willingness cruiser "Ukraine" - 95%. The content of the unfinished ship costs about $ 1 million a year. All in all, he, according to various estimates, "pulls" on the $ 1 billion. Negotiating the sale of an unfinished missile cruiser Russia has been going on for several years. His wanted to buy the former mayor of Moscow Yury Luzhkov and called "St. Petersburg"; it would pay for the "gas debts"; develop various projects for the establishment of joint consortia on completion of the ship. But the achievement of any arrangement prevented the bitter political confrontation between the two countries when President Viktor Yushchenko. In addition, the Ukrainians kept trying to take Moscow for the ship to the max. With the arrival of Viktor Yanukovych has changed drastically. Already in May last year, he said that Russia may finish the Ukrainian cruiser at his own expense. And in July, Parliament annulled the decision on conferring titles cruiser "Ukraine", as the ship will not be included in the Naval Forces of Ukraine. After that the commander in chief of the Russian Navy Admiral Vladimir Vysotsky said that command of the fleet is exploring the possibility of purchase of an unfinished missile cruiser "Ukraine". All this time negotiations on the fate of "Ukraine" took place behind closed doors, there were fierce disputes about the price. But as stated by the "Academy" a senior official, now everything is settled, and the Ukrainian side informed. Russia will take "Ukraine" just for nothing, not even at the price of scrap metal. And only after that would be considered different options for participation of Ukrainian companies in the completion of the ship. It will likely be renamed St. Petersburg as the Mayor of Moskva wants. With 3 modernized Kirov class, 4 modernized Slava class and modernized Kuznjecov Russia is back to restore former SSSR glory. it is still one of the Worlds most powerfull. They say it will cost $1 billion to restore... it will be quite a bit more than that. Is it posible to redesign Slava class using existing blueprints if they even exist? Think it would be cheaper than to start all over again from scratch. Btw I think its more expensive to refurbish old one. If that billion is spend on Russian parts and Russian Labour who cares? It means the Russian Navy gets a big ship and if they made it from scratch they would make it as small as they could to make it as cheap as they could. This way they will get a much better ship and the money spent will go to the shipyards so they can improve their skills on an old boat. Any major improvements they make could be applied to other in service boats of that type. And besides modernizing Slava class with new equpment with VLS S-400 / P-1000 would make this combat unit one of worlds most powerful. Who knows when will Russia design stealth version of 13 000 ship, so why not in the meantime have one non-stealthy but with powerful armaments. Someone needs to protect those Mistrals and modernized Slava would be best suited. And it seems a deal of cruiser Name NO, former Ukraine, is soon finilized. This Slava class ship has been in a building state for 20 years. The hull is appearently not so rusty, that it wouldnt be seaworthy. But weapons and all electronics will have to be exchanged for modern ones. 2 years of work? Then she will be comissioned into Black sea fleet. A good deal? Yes, for a new cruiser is many years away and this is a quick way to strenghten the fleet signifiencly. I also think that the other cruiser, Moscow is in need to be overhauled and modernized. Is the SSN-12 sandbox still the primary weapon? If so, its in dire need to be upgraded to the PJ-10 BrahMos, or P-800 Oniks. It might have Bazalt but I suspect they will change that to Vulkan as that is made by a Russian company. I wonder will they change the air-defence component as original Slava class has only one shooting radar placed at the rear. Im not familiar that Top Pair/Top Steir/Top Plate are able to guide S-300 missiles living only Top Dome for the job. But Top Dome is able to guide only 6 missiles at the time and does not cover 360 degrees around the ship. Something more modern with modern VLS/9M96/48N6DM and AESA on top would be appropriate. Hopefully with their standardisation programs in place they will unify the electronics and weapons and propulsion with existing Slava class vessels and will replace the large Bazalt missiles in angled launchers with a large number of UKSK vertical launch tubes for many more missiles. The reduction in size of electronics and other equipment might allow for the refit... because the old Bazalt launchers sat on the deck, whereas the new vertical launch bins take up space below deck. Perhaps a bit more automation to reduce the crew size and free up some more space might help? GarryB wrote: Hopefully with their standardisation programs in place they will unify the electronics and weapons and propulsion with existing Slava class vessels and will replace the large Bazalt missiles in angled launchers with a large number of USUK vertical launch tubes for many more missiles. That sounds like a good idea, but also a lot of rebuilding. As many shipyards have full orderbooks, perhaps the Ukrainian shipyards can be activated? Alot of smaller missiles in VLT tubes below deck, new airdefences, new electronics and new propulsion will almost make an entirely new ship. Rebuild time will be at least 2 years, perhaps even 3-4 years as its a project never done before. And to begin with, it will be Slava nr 4 to be first. Although i`m not sure it will be rebuilt to such a large extent. By the way, the new Ivan Green landing ship will be commisioned into Black sea fleet. I think the standardisation will work both ways... in building and in operation. A good ground up redesign with all new electronics and weapons can be applied to all the Slava class vessels they have, which means what they do to this Ukrainian ship they can also do to the Slava class vessels in Russian Navy service too (AFAIK they have 3 vessels so this Ukrainian addition will make a nice round figure of 4). This will make the upgrade cheaper and they can optimise the upgrade and will likely be quite efficient by the time they do the last vessel. The obvious other benefit is that you end up with a group of ships that use all the same standard stuff as the other new ships in your fleet which increases production of specific components which should reduce costs, both to buy, to fit, to use, and to maintain, and also operations costs and training costs and maintainence costs will be reduced because you learn how to maintain the main guns on one vessel and get transferred to a different class and it has the same gun connected to the same sensors... etc etc. The Russian missile cruiser Marshal Ustinov may reinforce Russia's Pacific Fleet in 2013 after repairs, a high-placed official of the Russian Navy said on Sunday. "In two years, the cruiser may be transferred from Severomorsk to Vladivostok to reinforce the grouping of the Pacific Fleet's surface ships," the admiral said, adding that the Navy's main headquarters was considering this possibility, although a final decision had not yet been made. The Marshal Ustinov, a Slava-class missile cruiser, was launched in 1982 and commissioned with the Russian Northern Fleet in 1986. "Now the cruiser is preparing for medium repairs in the Northern Fleet," the admiral said, adding that the cruiser's transfer to the Russian Far East was due to the quick ageing of the Pacific Fleet's warships and the need for this kind of ships to support the combat stability of the grouping of the fleet's strategic and multipurpose nuclear submarines. The Marshal Ustinov cruiser has been designed as a surface strike ship with some anti-air and ASW capability. It is fitted with sixteen SS-N-12 Sandbox nuclear-capable supersonic anti-ship missiles, which are mounted in four pairs on either side of the superstructure. In addition, the cruiser reportedly carries 64 SA-N-6 Grumble long-range surface-to-air missiles (SAM) and 40 SA-N-4 Gecko short-range SAMs. NATO experts had dubbed Russian combat ships of this class "the killer of aircraft carriers," as it can carry 1,000 kg of high-explosives, or a tactical nuclear warhead, out to a range of 300 nautical miles. Any news about admiral lobov slava class crusiser fate?